Tahoma High School’s winter drama performance of ‘Almost, Maine,’ is scheduled to run January 25-26 and February 1-2. Curtain time for evening performances (all days) is 7 pm, and Saturday performances include an additional matinee at 2 pm. 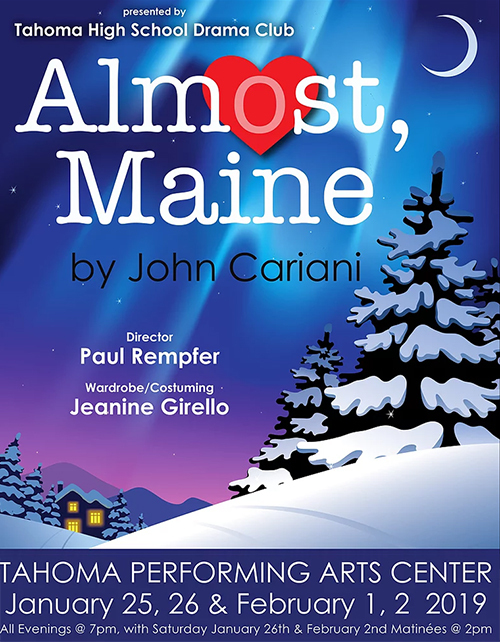 Directed by Tahoma’s Paul Rempfer, this romantic comedy is set in mythical Almost, Maine, where nine independent vignettes explore the complexities of love, both good and bad. ‘Almost, Maine’ is reportedly one of the most popular plays performed in 2017-18. The play is not without controversy, however, causing some school districts to grapple with some of the play’s themes.